Home / Blog / “Lighted” or “Lit”? We lit the Christmas candles. We lighted the Christmas candles. English speakers have preferred one or the other over time as demonstrated by the N-gram charts below. 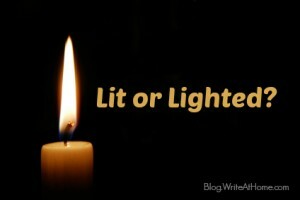 The first compares the appearance of lit to lighted in American publications, the second in British works. The recently lighted campfire lit our faces with a warm glow. One of the more famous uses of lighted is in the title of Ernest Hemingway’s short story, “A Clean, Well-Lighted Place.” But as the n-gram chart shows, well-lit has replaced well-lighted as the more common compound adjective. Please leave your comments or questions in the space below. Makes me think of the past tense of shine: shone or shined? I’m from Ontario, Canada, where we say “shone” (pronounced “shawn”), but more and more I hear “shined”. And what is the past tense of fight? Faught, right? But I’ve heard “fit”, as in “Joshua fit the battle of Jericho”. Yes, I’m thinking about writing an article that includes all of these tricky past tense verbs: shine, light, sneak, leap, etc. In almost every case, there are two acceptable options. This is true with shine . Shone is preferred, unless you are using shine to mean “polish to a luster,” but shined is accepted as an alternative in at least several dictionaries. How fun to view this in a new light, Brian! Either way sounds right to me. But the word ‘lighted’ sounds more poetic. If Hemingway had chosen this title, “A Clean, Well-Lit Place,” something would be lost. As a super fan of short stories, this one is among my favorite. Now I’m off to find a clean, well-lighted place to read it again. Leave a Reply to Shashikant Click here to cancel reply.